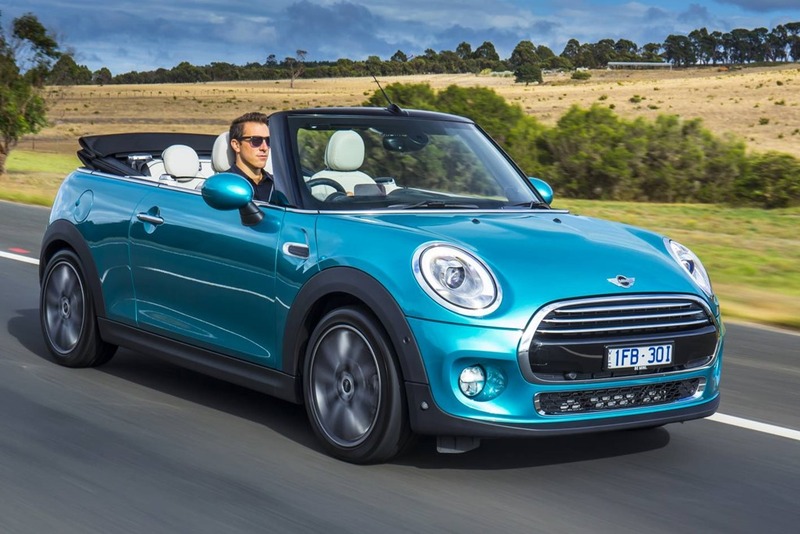 We sent Brent Davison to cover the Mini Convertible Australian launch. You can read about it here. I like the look of Mini very much. There is just enough of the “classic Mini” to evoke the memory of a carefree flower-power summer without being merely a hollow pastiche. In many ways, the 2016 models are exactly what the classic 60’s Mini would have been had it been in continual development. The look hasn’t changed much since the relaunch more than 15 years ago because, then it wouldn’t be a Mini would it? In true Mini style, much of what I loved about our test car was an optional extra. None the less, the $52,250 (plus onroads) price as tested is good value for a premium 2+2 convertible. The only option I’d have left out was the hideous dark stained genuine simulated artificial fake wood interior trim. It looked like old bits of garden shed had been whacked by a fence paling then glued in by a 5-year-old. It was nasty. The outside looked much like the model it replaced, but with the optional LED headlights, there was added panache mixed with je ne sais quoi in equal measure. Our test car had 3 optional packs, plus a host of other goodies, which added almost 13 grand to the MLP of $37,900 (add approx. $5,000 for drive-away price). The $3,500 “Chilli” pack adds Satnav, LED lights, Mini Driving Modes and fancy “Propeller” wheels. Run-flat tyres were added for $260 but made the ride too harsh for my taste. The $3,650 “Multimedia Pro” pack upgraded the satnav to “Pro”, added DAB radio and harmon Kardon speakers with a Heads-Up display for the driver. A further $1,800 for the Convenience Pack gave us Comfort access with remote roof operation, a mirror package, Park Assist and an alarm. The heated seats were $490 and their leather upgrades cost $1,700. Keyless start and go means the fob never leaves your pocket unless you want to wash your pants. Since Sydney has entered a mini ice-age, the heated seats were useful on the National Park run. With the outside temperature around 12c, the heating at floor level wafted gentle warm air around the nether regions, and the seats kept the bum and back toasty. Sadly, we didn’t know the wind deflector was in the boot, which would have made life even nicer. It is a folding-net-affair which fits in behind front seats, and extends from behind the front headrests to the top of the back seats. The cold air can’t leak forward, so the warm air stays where you want it even if you have the windows and roof all the way down. The roof has 2 modes, sunroof, and all the way. Unfortunately, the sunroof mode directs icy air down the front passenger’s backs. It certainly makes you sit up and take notice. When all the way down, the roof gives the full open air atmosphere that used to cost the GDP of a small African nation. For around $57,000 drive-away, you get a 100kw 3-cylinder turbo petrol engine putting out a decent 220Nm of torque. The base price is about $42,000 drive-away if you don’t get the option packs. 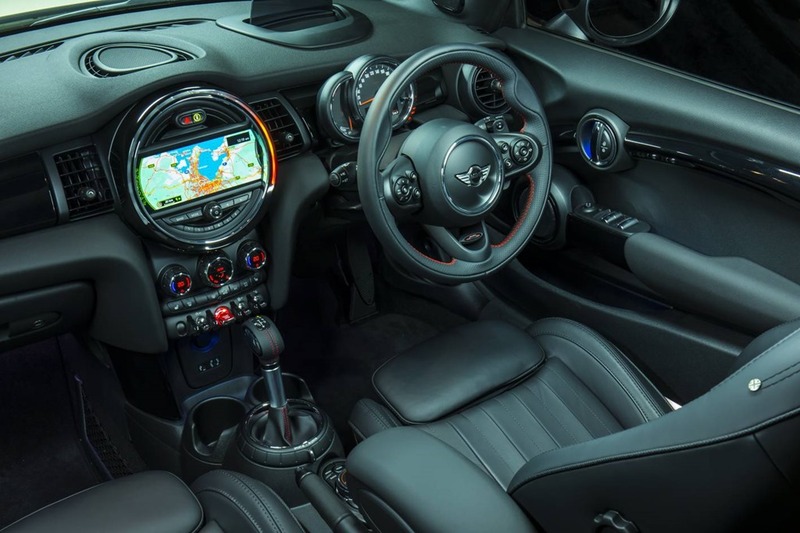 The optional “Mini Driving Modes” is meant to give the driver a way of changing the experience, but most of the time I just left it in normal. I couldn’t feel any appreciable difference. It’s part of a pack because I suspect no one would tick the box if it was on its own. I have a rule: never drive a convertible with the roof up unless the sun threatens to blister fair skin, or it is raining. The only time the roof was up was during a sudden shower. I discovered you don’t have to come to a stop for it to operate. The roof will work of speeds up to 30kph which is perfect for traffic. There are no paddle shifters, so manually changing the 6 speed auto gear box is a bit hit and miss until you get used to which way is up. The upgraded Satnav gets a track pad on top of the rotary dial between the front seats. Scrolling back and forwards through the menu is fairly easy and the inputs straight forward. I love the throaty little 3 pot in a way I never thought I would. It reminds me of some of the classic cars of the 60’s and 70’s with that raspy wheeze in full flight. As is my want, the Royal National Park beckoned. The allure of sharp bends and sweeping curves is irresistible. The deep shade of the dense canopy makes the shadows dance over the car and looks rather like fireworks when you’re in a drop-top. I entered the park at the northern end, something I usually avoid. You see, there are several turnoffs where locals insist on doing 10 or 20 KPH below the speed limit. 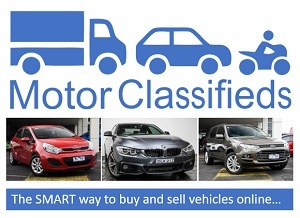 It is a favourite for sight seers too in their awkward SUVs and camper vans. Curse the lot of them. It was about then that I encountered a Kluga hell-bent in ruining the day of anyone behind it. We crossed the weir at 30kph and rounded the bend near the café to head up the hill. Kluga thought it would be super-awesome to slow to just 5kph. It pulled off to the left side of the road, before swinging right, sans indicator of course. Never mind, there was nothing in front of it so the road was mine alone. I let slip the dogs of doings and took off like a scalded cat. The gentle sweeping bends and dips gave way to deeply shaded blind corners punctuated. There were little streams of water across the road from the storms the night before. The crisp air and rainforest smells added a sense of surreal pantomime to the experience. Yet, somehow it felt like driving a simulator. In a simulator there is no feeling that she would have let go no matter how she was pushed. The go-cart handling is just like the “classic Mini” I love so much. I was temporarily transported back in time to an era before power steering and air conditioning, and horror of horrors, mobile phones. We came out of the thick forest on to the clifftop where the wild sea came into view, and I knew the most exciting part of the drive was behind me. Only the house with the glass pool sticking out over the sea, and the hairpin bend was left. The hairpin is to be taken at 15kph or death will quickly follow, but Mini was having none of it. It was like being flung into hell from a slingshot. The throttle response varied little even with the drive mode in “Super Exciting”. A combination of manual gear selection and brilliantly precise electric steering kept the rubber just where it should have been. 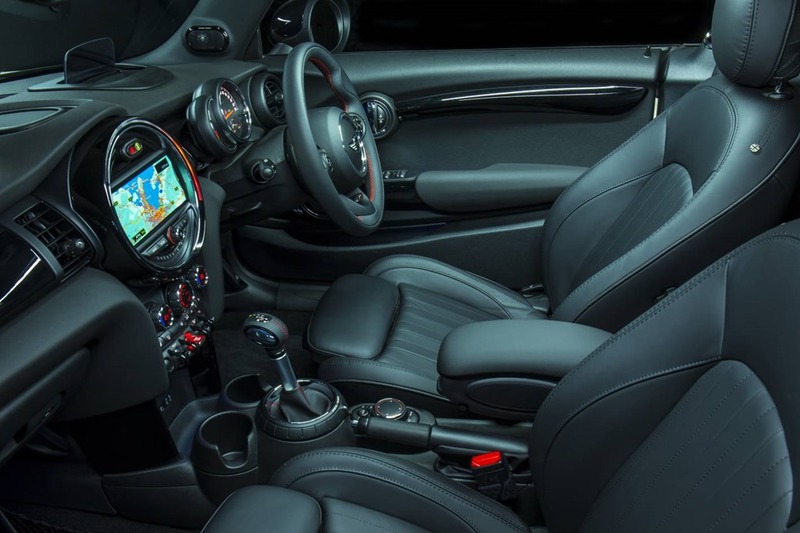 With little overhang at either end, a wheel in each corner makes the weight distribution near perfect, just as Sir Alec Issigonis intended when he penned the Classic Mini in 1958. I turned back for a slower, gentler run home. Of course I would keep a careful eye in the rear view mirror for anyone behind, unlike some we could name. No sooner had I started the return leg, when Kluga rounded the bend heading straight for me, on my side of the road. Normally there would have been little to worry about, but with a sharp drop-off no further than a metre from the passenger’s door handle, my eyes must have looked like saucers. With no time to think, and nowhere to turn, I threw out the anchors. Mini sensed the dilemma and applied full emergency braking and switched the hazard lights on. Kluga merely lurched back into its own lane with the grace of a geriatric pachyderm. It had missed the innocent Mini by what seemed like the width of a bee’s private part. The plucky little Brit had stopped in little more than its own length. The Kluga had displayed abominable roads manners, but just this once I was grateful that it was an ancient grey-haired tourist, and not an 18 year-old P-plater experimenting with death. The remainder of the run was emergency-brake-free with only Whipbirds as a sound track. I turned onto the highway still thinking about the moron who made my life pass before my eyes. I wondered about how many people Kluga had forced into shrubberies the length and breadth of the country. How could people be so useless? How is it that some get licenses based on almost no capacity to drive? On the highway, the mood was somber despite the roof and windows being down. As the bush gave way to traffic lights and Maccer’s stores, I raised the roof to see if my near death experience could be blocked out by a few layers of fabric, but it couldn’t. 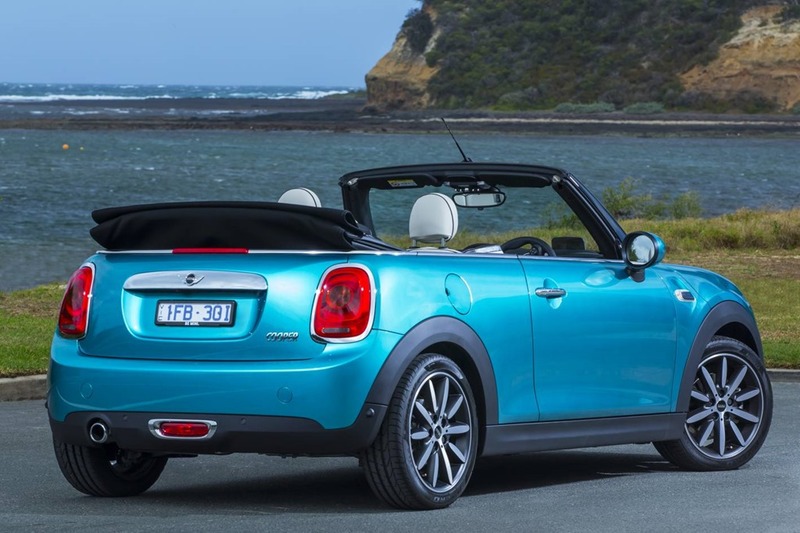 In the few brief kilometres the roof was up, I noted that the Mini was not as quiet as I’d have liked. There was a bit of background rattling and creaking from overhead, so back down the roof went after the shower had passed. Entering the secure underground lockup failed to erase the incident in what had otherwise been a joyous spin through the countryside. I shall not allow it to ruin the impression of the afternoon. Indeed, you could argue Mini did exactly what it was designed to do so no harm done. There was a time when power output was secondary to the way a car handled. You had to grab your ride by the scruff of the neck and in a way, the 100kw engine is a bit like that. Even with all the mod-cons, there was a real feeling of the classic 60’s experience. You could imagine a gingham cloth and wicker basket on the back seat. There’d be a couple of beach towels and some factor 15 in the boot just in case, and the radio would be playing 50’s hits. You’d probably find 50’s music as long as the DAB is in digital range. The audio upgrade is worth every penny because the killer sound system is just the ticket when you’d had a bad scare. I loved the Mini. All of the things people usually say are still true. Yes, it is expensive. Yes, there are way too many options, and yes, the ride is harsh. So, don’t get any options, especially the dreaded run flats. You’ll have a can of goo if your tyre goes down on you, so all is not lost. Run Flat tyres are meant to be driven under 80kph for short distances to get you out of trouble, but with roadside assistance who needs them. Ideally, I’d like a space saver spare tyre at the very least because a Run Flat has to be replaced after it has run flat. That’s a costly proposition if you do that more than a couple of times a year. I loved the quality feel of the cabin with the exception of the god-awful fake timber trim extra-cost option. The cabin is cosy and well laid out but the switch gear is a bit busy. The retro knobs and switch gear add a certain verisimilitude. The Climate Control is brilliant even on automatic, and the brakes work under the most stressing of trials. If you opt for the Heads Up display, buy a pair of sunglasses that don’t have polarized lenses or you may as well not have spent extra. The polarized Ray-Bans completely erase the HUD display even on full brightness. The display puts info onto a pop-up glass panel on top of the driver’s instruments, unlike my preferred method of projecting the info onto the windscreen. Even a heavy foot will return a decent fuel figure, so the only real niggle is that the ride was too hard, and the roof blocks most of your view rearwards when it’s down. It doesn’t completely stow away because BMW would like you to have a bit of luggage room in the boot. Friends laughed when I said I’d have this car any day. They said I’d be a fool not to buy Mazda’s MX5. I like MX5 a lot, but I wouldn’t buy one. It is simply too small. Yes, it is fun to drive, but you feel like you’ve been shoe-horned into a ballet slipper. 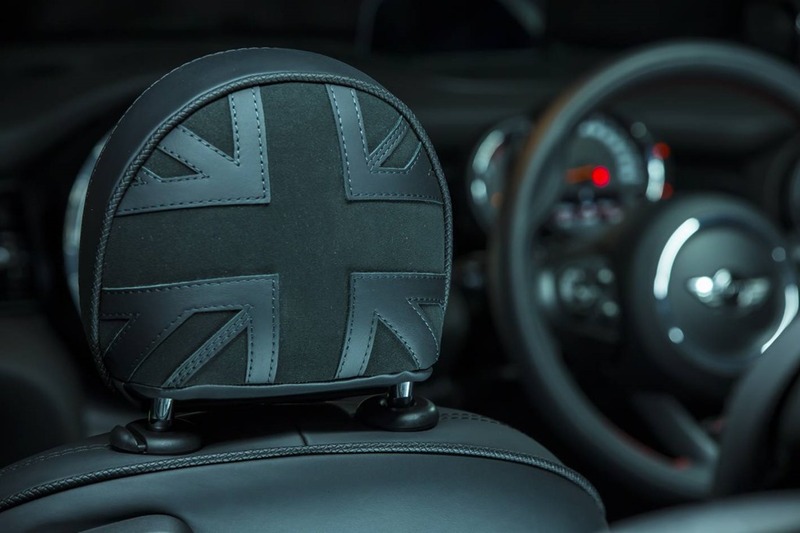 With the roof up it feels positively claustrophobic, and eventually all convertible owners will spend some time in the saddle enclosed by canvas. Taller drivers would notice their line of sight obscured by the top of the windscreen even with the seat all the way down, so with the roof up, your head touches it. 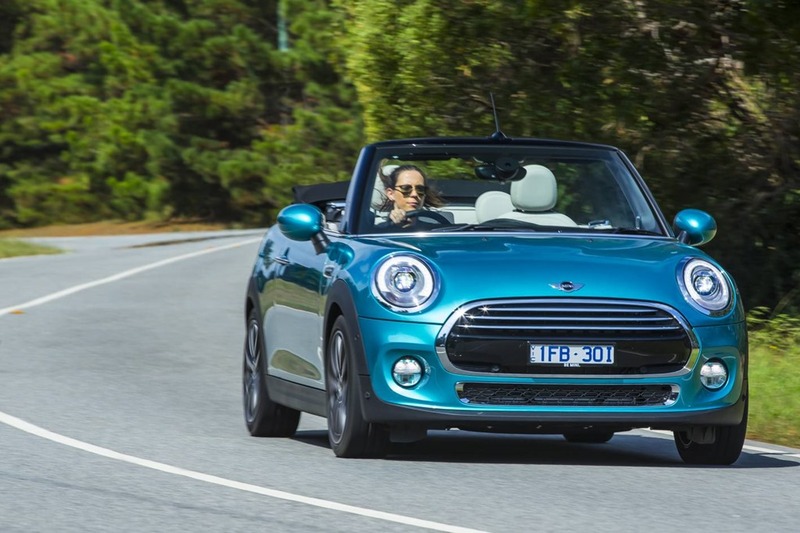 No, there are too many drawbacks to the Japanese roadster that don’t crop up in the slightly more expensive, thoroughly British Mini. The mini has more power too.